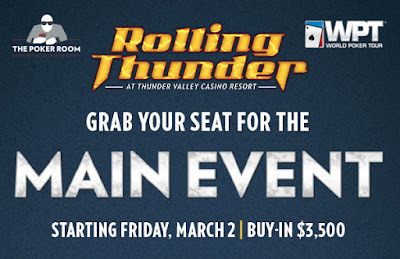 Not only does @WPT Rolling Thunder $3,500 Main Event get underway at noon tomorrow with Day 1A, but there's also 22 seats guaranteed in to the Main via Friday satellites. The main kicks off with players receiving 30,000 stacks and playing eight hour-long levels for their Day 1 play. The dinner break is scheduled after Level 8 so players finish up at 8:45pm and don't return until Noon on Sunday, a 39-hour-long dinner break. Day 1B follows the same schedule ... noon start, 30k stacks, hour-long levels, end-of-play after Level 8 at about 8:45pm, return noon Sunday for Day 2. Registration plus a single re-entry per player per Day 1 flight is available for all 8 Day 1 levels. There's also one single entry allowed up to the start of Level 11 on Day 2, for a grand total of five potential maximum entries available per player. 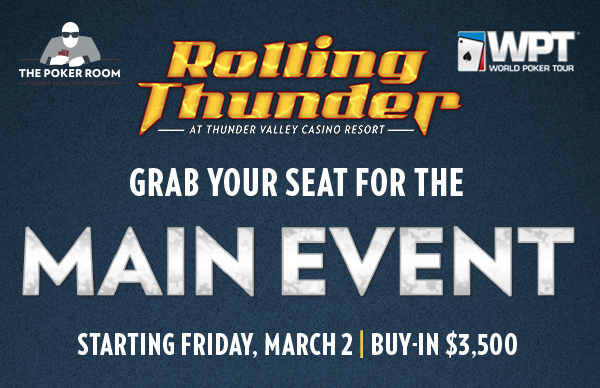 There's a 5-seat-guarantee turbo satellite at 10am, a 15-seat-guarantee at 6pm and another turbo at 830pm guaranteeing three additional Main Event seats.